… and another how-to video! In case my last post didn’t make up for my inability to make lots of new videos over the summer, here is another! This tie makes it look like you have a super long braid coiled around your head, when really it’s just a variation of the “kosher pigtails” tie. 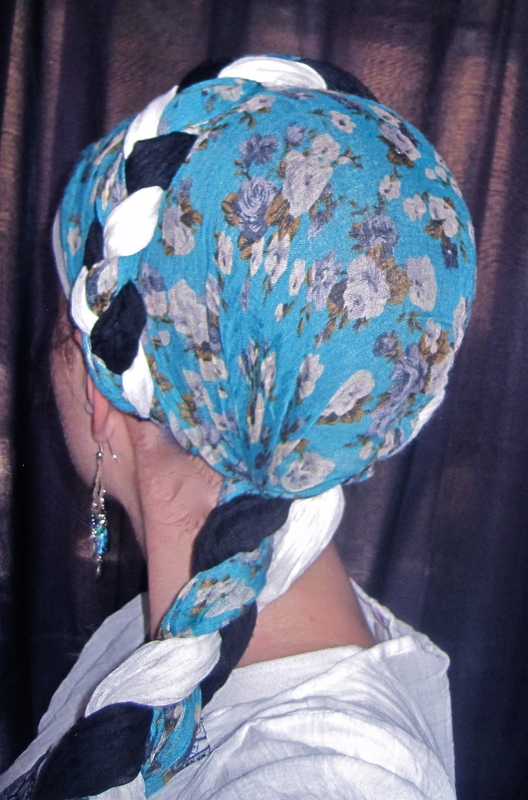 ← Three NEW Tichel Tying Tutorial Videos! Thank you so much for sharing. I especially love the turquoise blue tichel with the blue and while flowered scarf and the variegated blue scarf with the tails hanging. Question: obviously for modesty you are wearing a cap on your head while taping your tichel tying videos, do you wear the cap under the tichels all the time? Is it needed or can you get away with just wearing the headband under them? If you wear just the headband does it create a bump that you can see? In the picture of your tichel that is turquoise blue with the flowered blue tichel, are both tichels the wrinkled cotton? And approximately what size do they need to be? Thank you. I know I answered you privately but thought I’d write down here in case anyone else is wondering! – The headband can create a bump… but you can fold your tichels and wrap them in a way that it doesn’t show. It depends on how tight the headband is and how thick your hair is. – In the blue picture… the flowered tichel is thing cotton, and the wrinkled one is silk. – Approx sizes vary. Just make sure it will cover your head… but beyond that it’s totally up to you!